I’ve been a “maker” of some sort for as long as I can remember. I used to give handmade holiday ornaments to colleagues & friends, used to have an online stamping supply store in the days before Simon Says Stamp and Scrapbook.com (R.I.P, The Gifted Note), used to teach cardmaking classes, have dabbled in selling on Etsy and am still a stamper & cardmaker at heart, with the stash of supplies to prove it. And of course, I stop at nearly every “crafty project” video that scrolls through my Facebook feed and think “I can do that!” I also stop at nearly every cooking video, and cat video too. But we won’t talk about that. While all this has been going on, I’ve been working in website design and online marketing (aka, “the corporate hustle” ) for the better part of 2 decades. Currently, i’m in charge of digital strategy for a non-profit association that serves Oncology doctors, nurses, social workers, and their support staff. That definitely checks off the “I’m making a difference” box on my list of things that makes me feel complete, but for awhile now, I’ve had that itch to take what I know and apply it to something artistic — something mine. ☑ Tinkering with technology, branding, logo design, analytics and SEO. If you don’t know what any of those terms are, then stick around (aka, subscribe to receive my emails). Follow along as I apply these techniques to the Boutique and share the results, failures and maybe (hopefully!) a success or two. These flowers… gah, I don’t know. There’s just something about them. They are beautiful in their own right, handmade (which is awesome), sourced from a renewable resource (branches from a tapioca tree, of all things) and working with them offers, to me, a kind of therapy. Choosing the perfect container or surface, dying them to the exact right shade of whatever, adding some bling and arranging them just so. It’s a process and it’s gloriously satisfying. 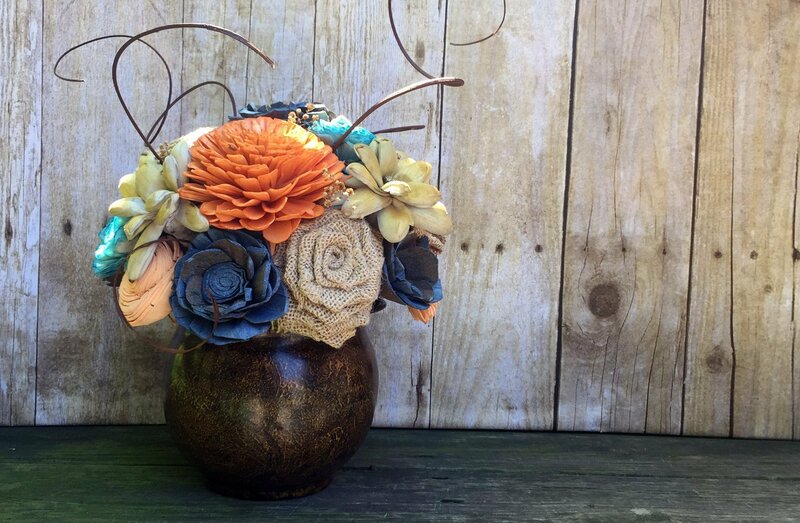 Maybe it’s that my arrangements allow me to apply different techniques i’ve picked up over the years — decoupage, stamping & heat embossing, diecutting and painting — as well as techniques i’ve been itching to try like vinyl, crochet, staining & finishing, just to name a few. Maybe it’s that I get to apply my own personal style to a curated inventory of things? Sourcing new suppliers, finding creative ways to repurpose products, and then bringing them to life in my creations and making them available for you to experiment with as well — that’s my jam, peeps! And so, this creative outlet of mine has reignited a spark that I thought I had lost. You know, that little voice that says “You’re good at this! 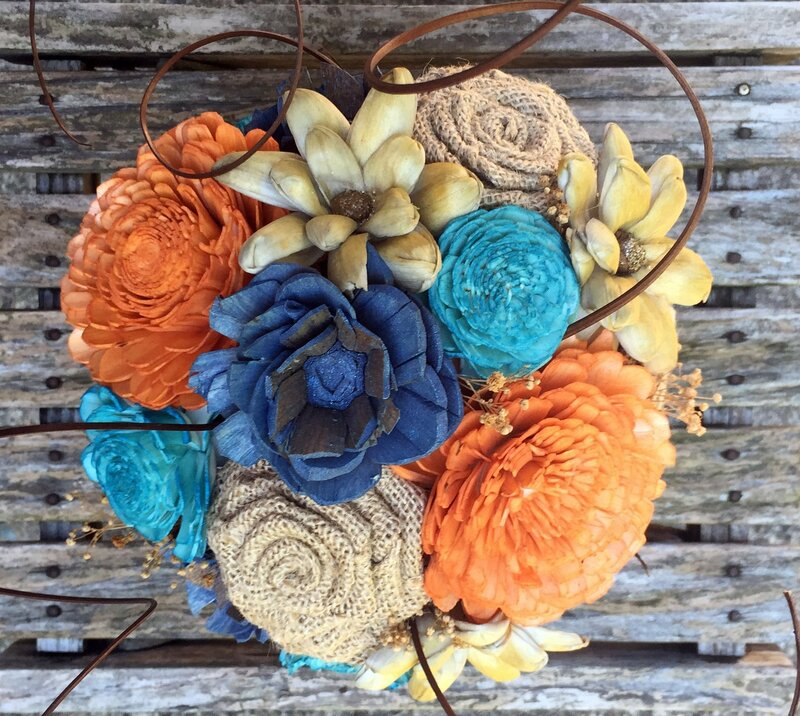 You should do more of this!” Well, that little voice has been shouting from the rooftops since I made my first arrangement and rolled my very first burlap rose. So, if you’ve read down this far, you probably think i’m nuts (4 CATS, RIGHT?!?!?). Regardless, I thank you for sharing your attention span with me, even if for just a few moments. If you like what you’ve read and are curious to see where this goes, then subscribe, yo!